Also available in a sharepack containing 12 x 15g bars and a special edition Cherry Ripe Double Dipped. Born and bred in the great county and a true Yorkshire man I have admit these Cherry Ripes are just the best chocolate ever! Cherry Ripes are delicious, the Ganache covered ones were heavenly, so can't wait for the Dark Cherry Ripe to come back in stock. No doubt out of this world!! My favourite chocolate bar by far - I spend a fortune getting these to Ireland! The cherry and coconut centre is nicely balanced by the dark chocolate coating, which means the bar isn't sickly sweet. I visited the Cadbury chocolate factory in Hobart last week. Found out that Cherry Ripe is the best selling Cadbury product in Australia. No wonder my brother, now residing in the UK keeps hassling me to send some over for him! It's not my favourite but he is my favourite brother so I guess I will have to organise you send him some. This is the best choc bar ever. I don't like dark chocolate or coconut, but boy does this bar cancel that all out. The cherries in it make it so moist and delicious. A mouth watering chocolate bar that would see me eating 3 in one night!!! LOVE IT!!!! Dizzy with success at having my review published (or possibly through needing a Cherry Ripe sugar-high)let me be geeky and add that Mac.Robertson commenced manufacture in Melbourne during 1924, taken over by Cadbury in 1967 (Wikipedia). How could it be less than 5 star? That's why, as a lapsed Melburnian, I've been eating them- but only since 1942. Not Cadbury. Mac.Robertson.This combination was dreamt up long before Cadbury muscled in in the act.Still to die for decades later.Trust me -I should know at 70 and still devouring them! My favourite chocolate bar with a taste of Oz! I wish they were available anywhere in the UK! Easily the best offer I have seen for this product in the UK! 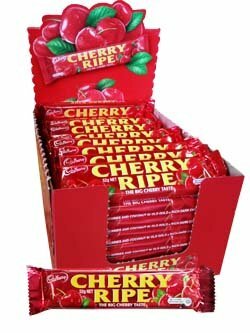 Tried a Cherry Ripe in Australia in 1991 and every now and then the urge to have one again, strikes. Amazing chocolate bars. Great shop for selling them!! If you take a bite of a turkish delight bar and a bounty bar at the same time you will get a good approximation of the great CHERRY RIPE! Definately worth emigrating for. If you know anyone with spare space in the case fill up with Cherry Ripes. I need CHRRY RIPES!!!!!!! They taste like nothing else in the world. Sweet, dark and with hint of a tropical paradise.. what more can a girl want?! Oh the uncomplicated relationship between a girl and her chocolate bar ..
Next to try the Cherry Ripe Roll!! Cherry ripe are just so delightful they make me fell like I'm in heaven there amazing!!!!!!!! There is nothing in the world that cures my homesick like a Cherry Ripe! The old gold chocolate and the coconut cherry filling...anywhere I've lived, I've never found anything that even comes close! Even though I have a vast appreciation for my mother and would give her the shirt off my back, I would still fight her to the death for the last Cherry Ripe in the kitchen cupboard. The most delicious and exquisite chocolate bar I have ever had the pleasure to eat. Without a doubt a very fond memory of my trip to Australia. Cadbury's really knew what they were doing when they combined dark chocolate, coconut and cherries in this amazingly morish chocolate bar! One is never enough and once tried you will be hooked for life! These are just unique. The dark chocolate and then fresh cherry flavour, I can almost taste them now.